An artist's concept of Made In Space’s Archinaut spacecraft 3D-printing and assembling satellite reflectors in space. The nascent off-Earth manufacturing industry is getting set to take its next big steps. Made In Space, the California-based company that owns and operates the commercial 3D printer aboard the International Space Station (ISS), is developing new technology, called Archinaut, that's designed to enable the assembly of large structures in the final frontier. Building structures off Earth would also allow them "to be space-optimized," Rush said, "rather than engineered to survive launch." 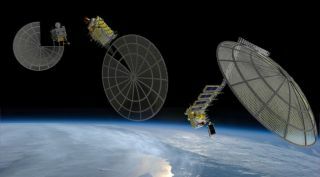 The Archinaut concept integrates a 3D-printer and flexible robotic arms into a single spacecraft capable of manufacturing parts and putting them together in space. In addition to building structures anew, Archinaut could help repair or upgrade existing satellites, Rush said. Made In Space has been working on the project for about six months. NASA selected the idea for funding in November 2015 via a "tipping point technologies" solicitation, and the company (along with partners Northrop Grumman and Oceaneering Space Systems) got on the $20 million contract roughly a year later, Rush said. Made In Space's work on Archinaut currently focuses on figuring out how best to manufacture "extended structures" in the space environment, Rush said. This research involves testing at NASA's Ames Research Center in Moffett Field, California — Made In Space's next-door neighbor — and analyzing samples created by the ISS commercial 3D printer, which is called the Additive Manufacturing Facility (AMF). The next step will involve adding the robotic-arms component into the mix, Rush said. All of this is part of the project's first phase, which will last a total of 18 months. After such work is complete, Made In Space and its partners aim to launch an Archinaut demonstration mission to Earth orbit. That flight had been pegged for 2018, but the timeline might end up being pushed back a bit, Rush said. "For the Archinaut development program through NASA, that's kind of dependent on Phase 2, which is to be announced," he said. The demonstration mission will likely build a space structure a few meters across, Rush added. There should be bigger things to come, however. "Where this gets really interesting is, tens [of meters] to 100 meters plus," he said. "And that's what we're angling toward." "That's what we think is the attainable future that Archinaut enables," Rush said. NASA isn't the only organization interested in Archinaut. Rush said that Made In Space is also working with a commercial customer on an application for the technology and will turn over some hardware to this customer (which he declined to name) at the end of this summer. Made In Space is also negotiating with a half-dozen other potential customers — some of them government entities, others in the private sector — on the possible use of Archinaut tech, Rush said. Made In Space partnered with NASA to build the first-ever 3D printer aboard the ISS, which reached the orbiting lab in September 2014. NASA owns that printer. But Made In Space owns and operates the AMF, a second-generation machine that arrived at the ISS in March 2016 and prints out parts for a variety of customers. The company plans to develop Archinaut tech on a similar path, from demonstration mission to a series of increasingly capable, commercially operating machines, Rush said. "Visions of what this could do have been with us for a long time," he said. "We want to do good work, and we want to learn from it."